A friend of mine, born in ex-Yugoslavia, told me several years ago that in the last census he declared himself a Bulgarian, as his father was born in Dimitrovgrad and has a Bulgarian surname, his sister wrote down she was Montenegrin, as there is where their family lives, his mother said she was from Herzegovina and his father defined himself as a Yugoslav. Yugoslavia does not exist as a country any more and the new border lines that were set up after it fell apart cannot be actual boundaries within a family, but should this become a reason for high officials’ conflict as was the case last week between the Croatian Prime Minister and the Serbian President? 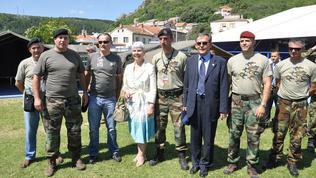 At the anniversary of the operation on August 4 Croatian Prime Minister Jadranka Kosor decided to greet former Croatian generals Ante Gotovina and Mladen Markac, the military commanders of the operation. Both generals, however, were sentenced by the International Criminal Tribunal for former Yugoslavia (ICTY) for war crimes to 24 and 18 years in prison, respectively. Gotovina’s arrest and transfer to the Hague Tribunal, on the other hand, was a turning point in the process of Croatia’s EU integration. His arrest came just a week after the country started accession talks with the EU, while his deportation happened a few months after the country completed them. Although Croatia agreed to hand the generals to the ICTY, both of them, especially Gotovina, are respected as national heroes, while the Storm operation is seen as liberating because it brought to and end the 1991-1995 independence war. The operation, which started on August 4, 1995, was aimed at taking back the Croatian area around Knin from the Serbs that opposed Croatia’s independence. The operation resulted in hundreds killed and thousands fleeing Serbs during and after it. 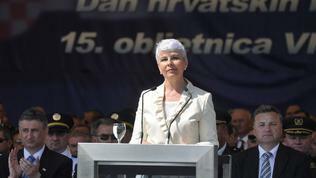 The authorities in Belgrade challenged Kosor’s statement, while Serbian President Boris Tadic condemned the words of the Croatian Prime Minister with which she expressed her gratitude to the two generals for taking over the operation’s commandment, in which over 200,000 Serbs were killed or expelled. "I consider it a very important fact that all charged with war crimes, including the Croatian generals, were sentenced at first instance and that they are in the Hague. Prime Minister Kosor’s statement does not contribute to the development of positive relations between two neighbouring countries that are trying to cooperate on a high level following the conflicts in ex-Yugoslavia in the 1990s, which left a lot of victims and refugees behind them", Tadic said in a special statement. He defined Kosor’s policy as irresponsible and said no election campaign and political battle can be based on the perpetrators of such crimes. The press office of the Croatian government said in response that “the liberating operation Storm was a legitimate and fair operation, which fought the aggression policy of Slobodan Milosevic”. “Not only that the Storm operation helped liberate the occupied areas in Croatia, but the victory over the oppressor paved the way towards democracy for our neighbours too,” the statement also read. There are no guilty and innocent in this summer storm. The victims of anyone’s aggression will always be victims, but the path to democracy is definitely not paved by mutual accusations, rather it is paved by hard work and mutual respect. Both Croats and Serbs seem to have a long road before them, as it can be seen from the next personal story I am going to tell you. A few years ago, a group of Serbs and me decided to go to Dubrovnik (we were staying in a nearby town in Montenegro). Eventually, just one girl from the group decided to join me in the trip, provided that we do not go there by car – she was afraid that it could be set afire because of its Belgrade licence plates. Back then I understood that the wounds from the broken boundaries have not been healed, but the mission of politicians is not to set old conflicts on fire, but, among other things - to work so that their citizens can live peacefully without any additional tensions.